Some extra features and others that are worth re-iterating. 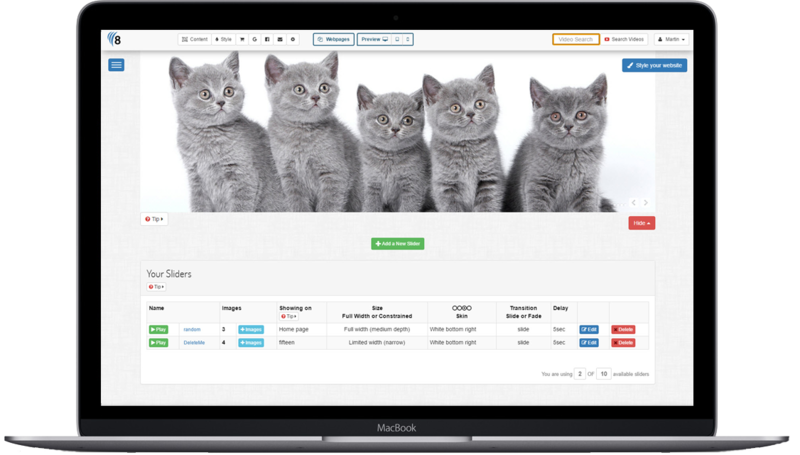 Not only are the features of our website builder rich and comprehensive, but they are easy to use too. A few features that we have missed and one or two that are worth re-emphasising. If you want to talk through any of these featires why not give us a call? Tell Google what you want to be found for. Easily craft the way each of your pages appears in the Google listings. 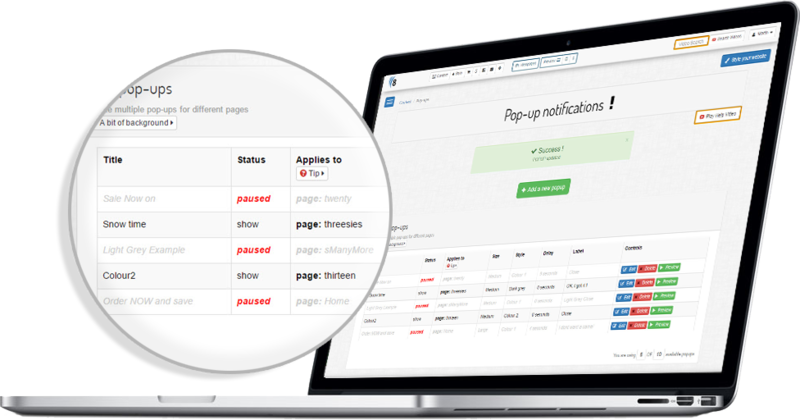 We provide free tools that make optimising your site simple and fast. Most websites require a page where your customers can contact you. Rather than build the page from scratch, we allow you to choose the style of the contact page and decide what information you want to include. 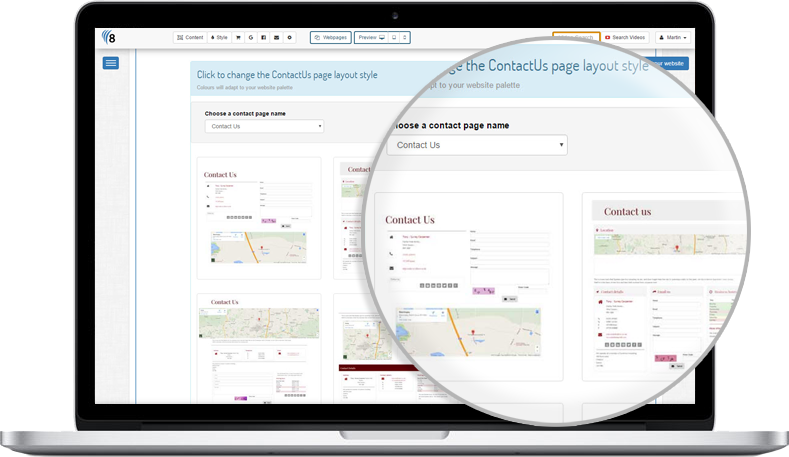 Customise your contact-us page with a readymade contact form linked to your email address, bespoke text, opening hours and extra contact numbers and email addresses. The result is a professional, beautifully designed page that presents your business and encourages your visitors to contact you. When your clients use the contact-us page contact form we save a copy of the email for you. We place a copy of the mail into your own inbox. You can then review incoming mail and filter out any spam. We also store the email addresses of anyone that contacts you using this form. You can then turn all these email addresses into a mailing list that you can use for bulk mailing offers or newsletters. 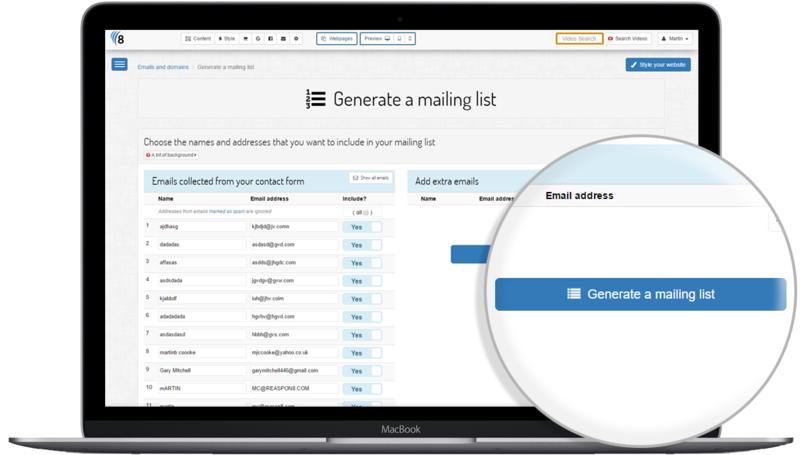 You can even add extra email addresses to this mailing list, from other sources. Edit your text with an editor that feels instantly familiar. 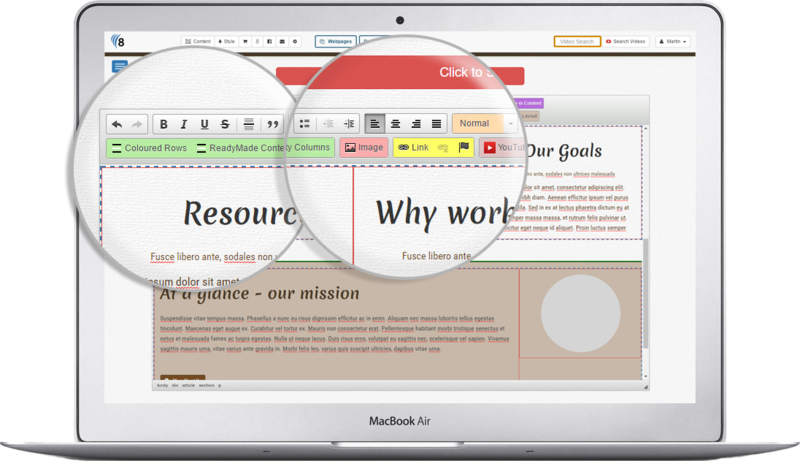 If you have used Microsoft Word before you will be comfortable with the look and feel of our content editor. But there is so much more to the powerful editor that takes website styling to a whole new level. Plug-in rich, interactive content, style images and 3D parallax image content with just a couple of clicks. Insert YouTube videos in a way that 'just works' on any device from desktop to mobiles. The quality of a website is directly related to the quality of the images used. But cropping, resizing and generally editing images can be difficult and time consuming. Not anymore. 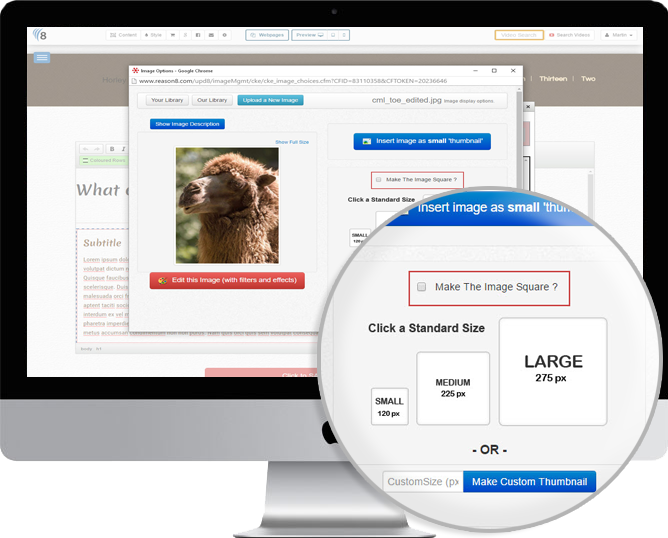 Included in our website builder is a free, simple, powerful image editor. 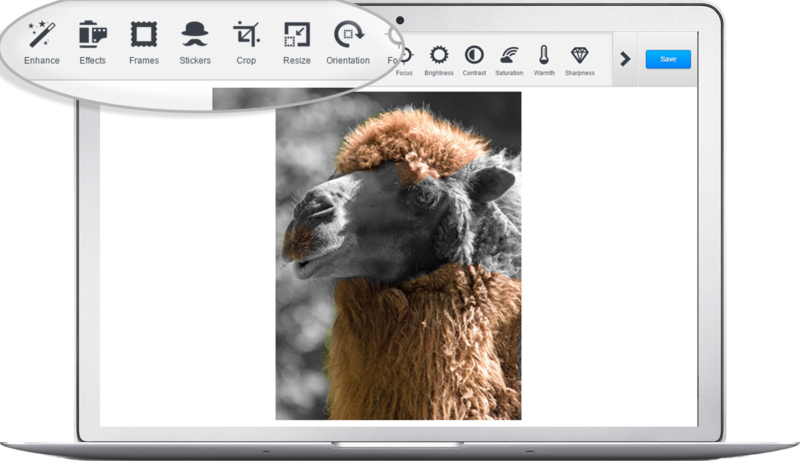 Add filters, borders, crop, resize and make your images perfect with a couple of clicks. Create dramatic, high-impact, professional image sliders at the top of your webpage. Create multiple sliders and choose your own images. Decide which pages each slider bar will show on. Add customised animated text. Even Add videos. 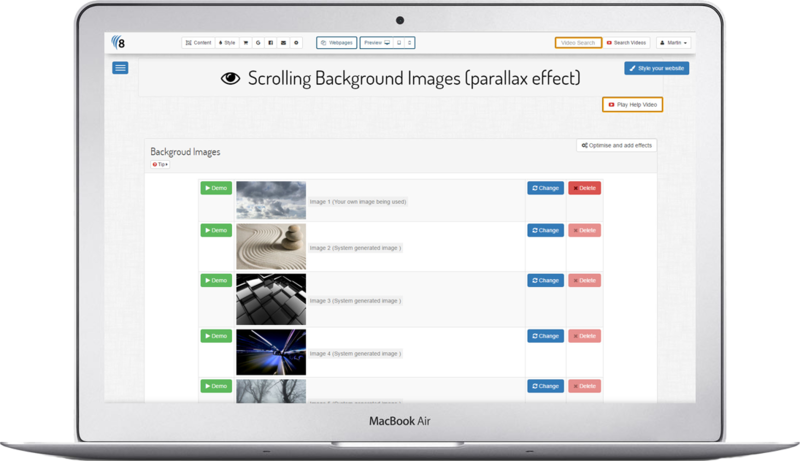 Re-order slider images, change transition type and slide duration. All with simple controls, checkboxes and intuitive menus. Create amazing looking galleries to showcase your products or services effortlessly. Drag and drop images from your own library into multiple image galleries. 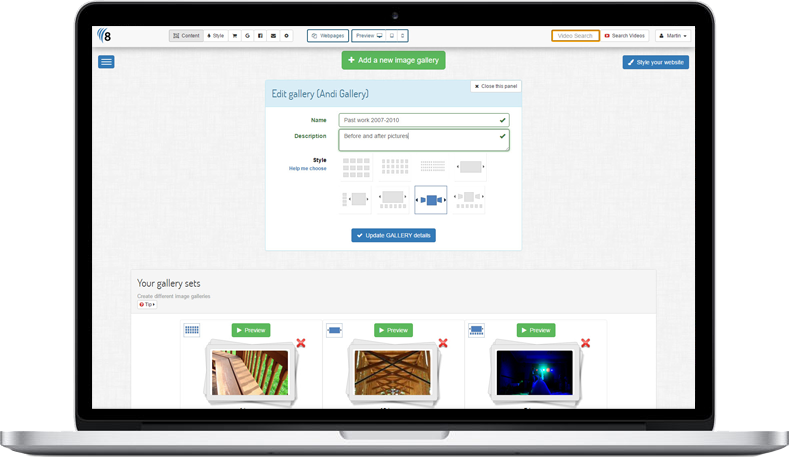 Choose the way the gallery appears and plug-in the gallery to as many pages as you like. Add image descriptions. Update and change the images in each gallery whenever you like. Create programmable popups to advise your clients of important information or offers. Retain full editable control of the popups. Add images, text and animation. Choose the criteria and timings under which the popups will appear. Archive popups for re-use and seasonal offers. 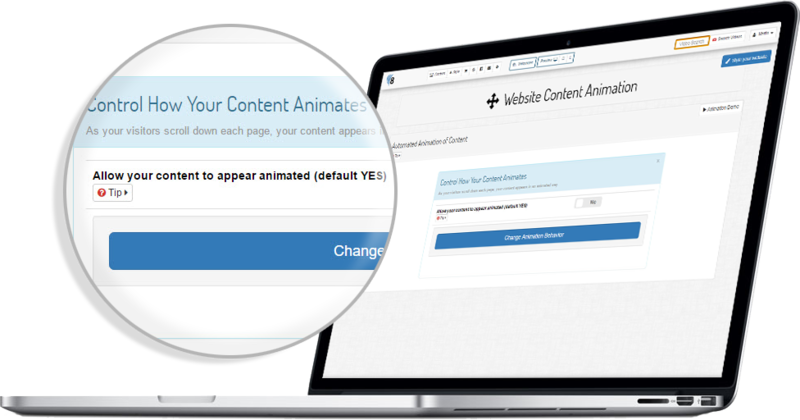 Create beautiful animated frequently asked questions and their corresponding answers. Add each question and answer one by one then choose a style. You can create multiple sets of Q&As and plug them into different pages. 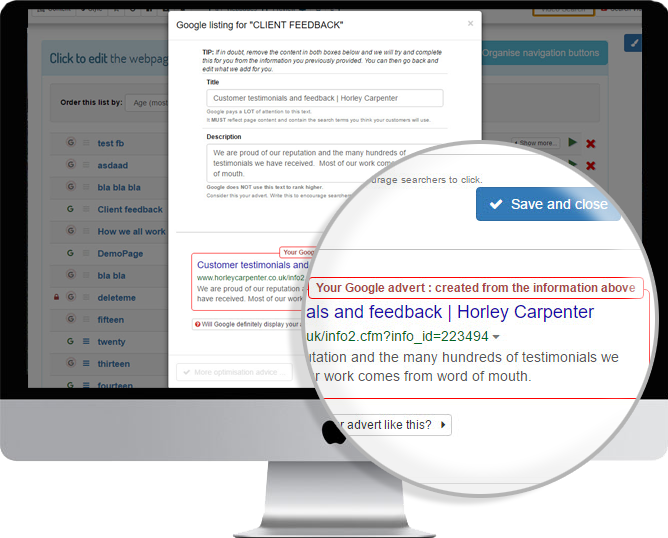 Create slick sets of client testimonials quickly and easily. You simply add details of the client and what they said and we do the rest. 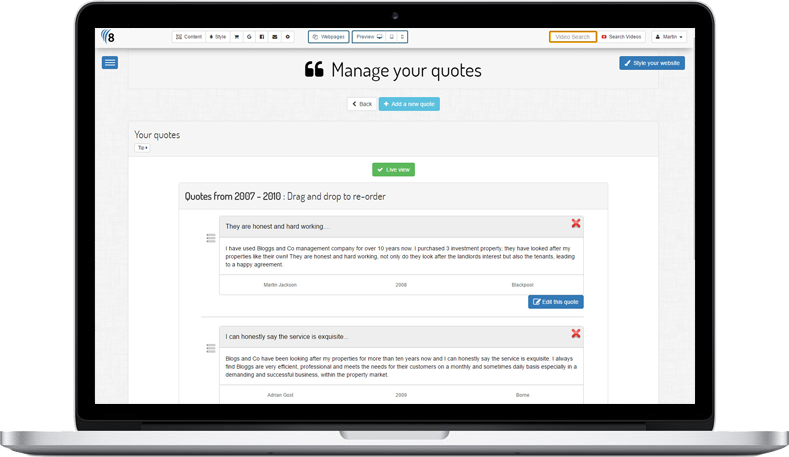 Choose the style of the quotes and then plug them into the page. Add additional testimonials in one place and all pages are updated. Add multiple styled interactive Google maps onto any pages you choose. Just add a postcode. town or city and the style you want for your map. We then add the map(s) to the page(s) you choose. Its fast and easy and looks very professional. Bring your content to life, or enhance important messages with 3D parallax image backgrounds to sections of your content. Choose the images you want to use. Apply a coloured filter that matches your palette to match the background to the content. If you prefer a solid colour background choose from plain neutral colours or colours that link to the applied coloured palette. Content and important messages can be enhanced with the appropriate inclusion of video. You Tube videos can be searched for, added to your pages and styled direct inside our powerful image editor. It takes seconds to insert your videos and best of all they are scaled down to show perfectly on any device automatically. You can add as much or as little animation as you like. As your visitors scroll down your page choose to have your content enter the 'stage' with bold animation. As you roll over your logo, linked buttons or hyperlinked images, apply eye catching animation that hints to the user that there is something to be clicked . All this can be achieved by switching animation on or off and choosing the animation effect you want to apply. There are times when you want to place a thumbnail image on your webpage and include the effect where clicking it opens up to a full size image with your background dimmed and the full size image stands out. Every time you add an image to your webpage you can simply click a box to include the effect. Choose the size and shape of thumbnail and we'll crop and resize a copy instantly. What's more we will even make sure it works perfectly on mobile and tablets automatically. Sometimes you may want to hide certain pages from the general public. Perhaps you run a kids club or nursery and only want parents to view pictures of the children. Perhaps you run a wholesale and retail business and only want your wholesale customers to see the discount prices you sell. Whatever the reason, you can lock your webpage and assign usernames and passwords to certain users. 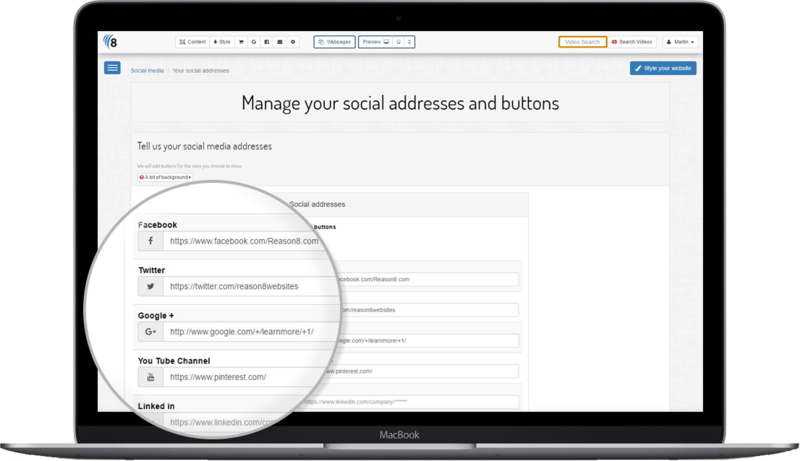 Password reminders are sent out automatically and you can view historical login details. These days a website is only part of your online presence. We make sure that your website works together with your other social media accounts. Include feeds from your accounts. Post directly to your social pages and share information effortlessly. Whether your new website has one, or many domain names, we make managing them simple. No jargon, just simple info with ticks and crosses and straight forward explanations. Once you have added a domain name to your website, why not create an email too. A connected domain name and email address is so much more professional than a free hotmail, gmail or yahoo email address. Just choose any prefix and enter your existing email address. You then advertise the new professional email address and we'll forward all emails direct to you. 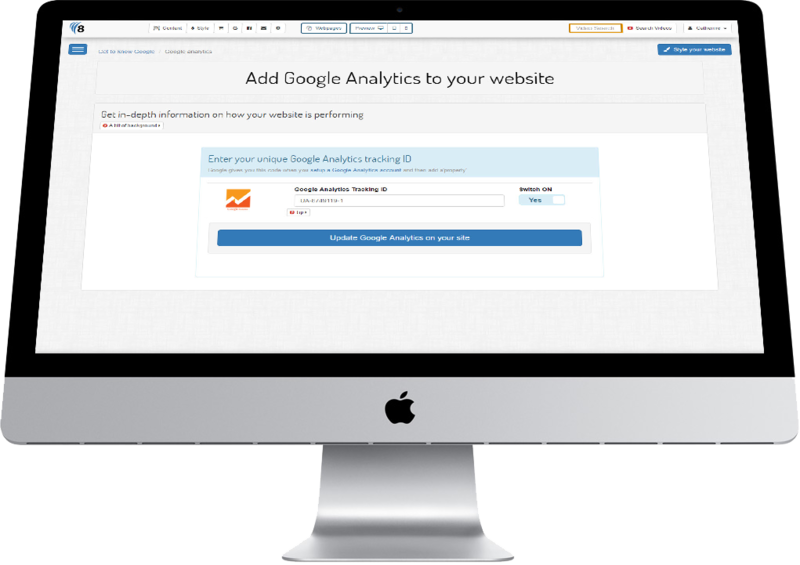 Signup for a free Google Analytics (GA) account and enter the user number they give you in one box and we'll do the rest. We'll make sure that the Google tracking code is placed on every page of your site, so that you can track your site's performance. GA is ideal if you want to know how well your website is performing, which pages are the most popular and how you could improve your visitor experience.